The Master Collection is a money saving bundle that includes both the Business and Creative Editions and includes 1 year of free updates and installation on two computers. By purchasing the Master Collection you will save up to 25% versus purchasing the Editions separately. The Business Edition contains all the shortcuts for popular business applications such as Outlook, Word, Excel, Quickbooks, Goldmine and Act. The Business Edition includes 1 year of free updates and installation on two computers. This Edition includes over 15,000 shortcuts from the creative application heavy hitters in the industry, such as Adobe, Autodesk, Maya and Avid. If you work in animation, CAD, graphics, video or design, this is the Edition for you! 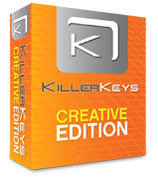 The Creative Edition includes 1 year of free updates and installation on two computers. 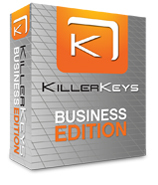 *After the first year, KillerKeys will continue to function normally, however if you want to receive any new updates, you will need to renew your updates at a nominal fee. KillerKeys VR for Mac offers individual applications via in-app purchases. © 2014 Bella Corporation. All Rights Reserved.